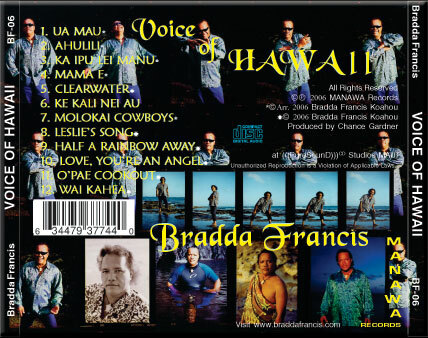 In 2006 his new release on MANAWA Records ,“Voice of Hawaii”, personifies this Hawaiian Renaissance man born of the contrast of his family heritage and the modern Hawaii he grew up in. This, his first National release, is a true balance between traditional Hawaiian music and the 21st Century. Predominantly sung in Hawaiian it includes some original songs in English and Hawaiian and some in English but they are all about life in Hawaii, ALOHA style. The beautiful NA IPU LEI MANU is the spoken history (in English) of a Hawaiian King and the love song his Queen wrote for him (in Hawaiian) that he never heard. This CD begins traditionally with UA MAU an homage to God. There is the traditional MAMA E as a duet with his mother, even a visit to MOLOKAI and a traditional HAPA-HAOLE yodel. 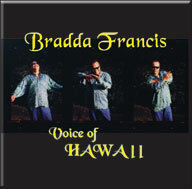 Put it all together along with six original songs and you get a full serving of the rainbow of talent that is the man, the voice, the power of Bradda Francis. Click here to Buy This CD!!! !